Getting your pontoon on and off the water used to be an expensive proposition. 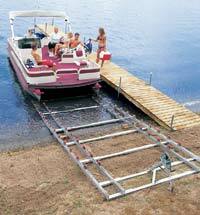 Roll-n-Go’s docking system for pontoons handles pontoons up to 2000 lbs. with 18″ to 26″ (round only) pontoon diameters. Rails adjust from 66″ to 82″ on-center pontoon separation. Includes 52 polyurethane “donut” style rollers, which mount anywhere along rails. Also available are complete 9 foot add-on sections. The standard 1700-lb. winch with 25′ strap is upgradeable to a 1500 or 2500-lb. self-braking winch with 25′ or 50′ cables. Easy to assemble, includes ground anchoring system. MAX. WEIGHT CAPACITY 2,000 lbs . 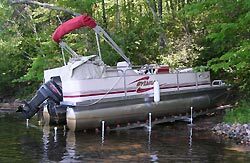 *Adjustable rail width for round pontoons spaced between 66″ and 82″ on center. Copyright © 2018 Waterfront Products, Michigan. All Rights Reserved.